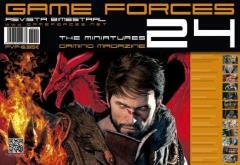 #24/Spanish w/English Translation #13 "Dance Morko Dance, Turkish Baths, Screaming Bell"
For those of you not familiar, Game Forces is the premier bi-monthly miniatures magazine published by Hobby World of Spain. 20 issues and with over a 2 year publication history, it is one of the most reliable and best produced independent fantasy and SF miniatures magazine you will be able to get your hands on today. If you've been a loyal reader of Game Forces magazine, you will remember that Game Forces, Spanish edition, comes with a translated sheet into English for you to follow along with the Spanish articles.